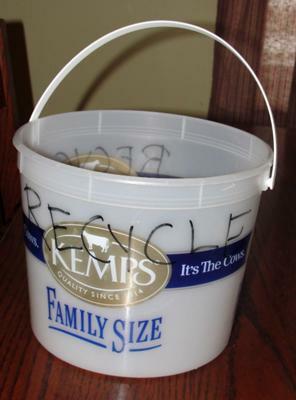 Adding a home recycling bin or containers to your kitchen or other area of your home is essential if you and your family want to start recycling items, instead of just trashing them. 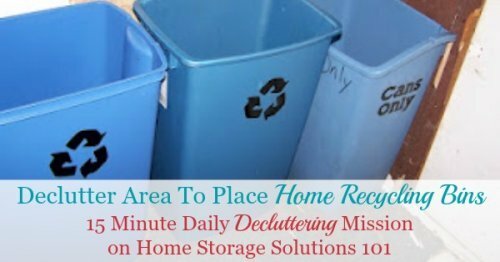 As part of week number six of the 52 Weeks to an Organized Home Challenge I asked readers to create a home recycling center, and many people wrote in to share their system and what worked for them. 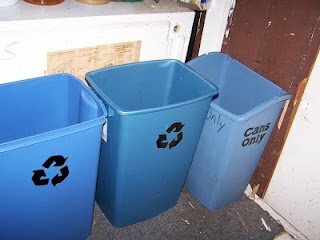 I really enjoyed looking at everyone's pictures and ideas (scroll down to see them all), because it really gave some great inspiration for how you can increase the recycling efforts in your own home, without too much extra work or effort. Plus, I like seeing what has worked for REAL families, don't you? 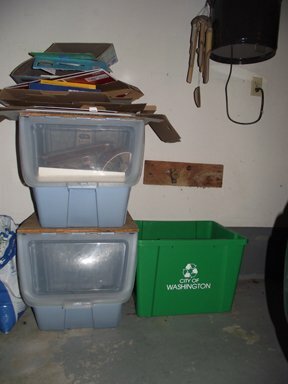 The first step in the process is, of course, to decide where you'll place your recycling center, and set up the containers where you'll sort and organize the recyclables. That's why today's Declutter 365 mission is to declutter this area. 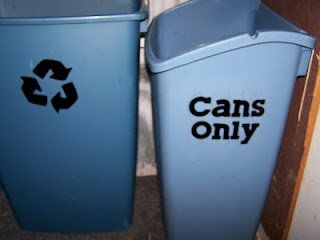 To get ideas of where to put your recycling center, and what kinds of containers may work well for you, scroll on down. 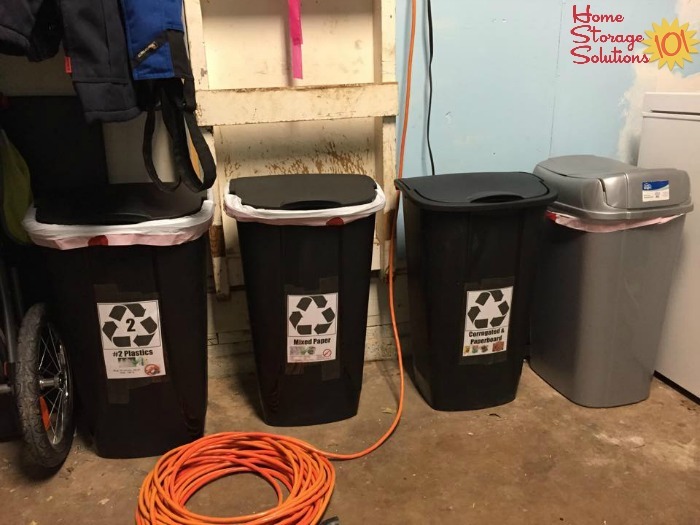 In addition, if you get inspired by these pictures and tips, please take pictures of how you recycle in your home, and submit them to the Home Organization Hall of Fame, and I'll feature the best of these photos here on the site! Megan from Life of the Lorenzens shared her system for recycling in her home. 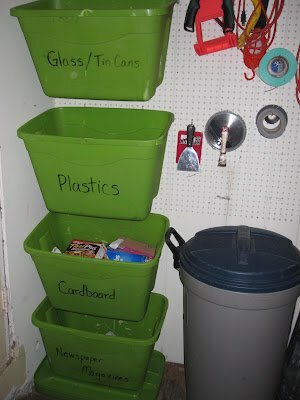 They keep most of their recycling in their garage, where they've made their own sorter using the green plastic tubs which are hung from hooks in a pegboard. Since it would be inconvenient to go out to the garage each time that they wanted to recycle something, Megan has also created a satellite collection center within her pantry. She explains: "Most recycling items are collected in the large white basket and sorted in the garage about twice/week. (This will eventually be the kids' job.)" In addition, in the pantry she added a couple of informational sheets to the wall that remind her what her local recycling center will and will not accept. You did a great job Megan! 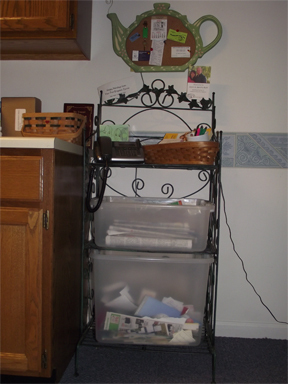 The photo above is from a reader, Shirley, who said, ""Had shelves in two corner cabinets for over 20 years. Referred to those cabinets as "the black holes". HATED THEM!!! 2-1/2 years ago, did a total makeover in my kitchen. One is a two shelf lazy Susan that I use for all my baking pans and such. The other one is quite possibly my favorite feature in my new kitchen - a three can recycling center!" If you don't like your rotating lazy susan corner cabinets this may be an idea you want to consider. 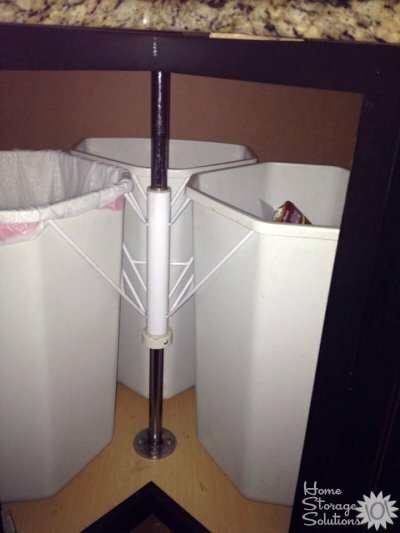 It allows for use of this space, and also for you to hide both trash and recycling bins from view in your kitchen. 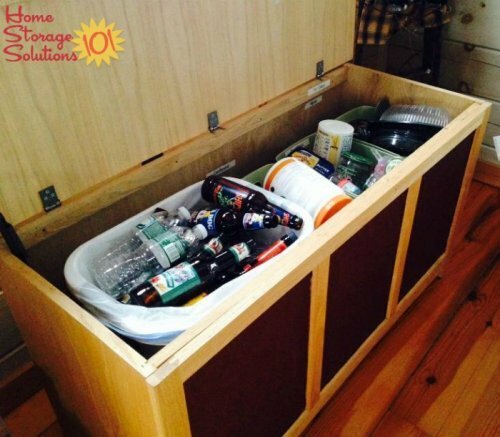 Carrie shared this picture on Home Storage Solution 101's Facebook wall. This is my 'recycling center'. I'm not sure what all is included in the challenge, but this is what I've got. I have big garbage cans in the garage I empty these into. It's all commingled now, so I could get by with one container. Old habits die hard! The plastic bag that's hanging is for box tops for education, etc., so when I take them off the container, It's right by where I throw the container. Thanks for sharing your home recycling center Carrie. I think it is definitely easier for those people who don't have to separate their recycling, but what I am seeing from everyone is that even if you don't have room for separate home recycle bins or containers for each type of item having one container can still work. In that instance you just need to create a routine to actually empty the single container on a regular and frequent basis into larger separate containers in a separate area, such as your garage or an outdoor shed. In that case big garbage cans, as long as their labeled for what you should throw in them, will work just as well as more traditional recycling types of containers and bins! I also completely love the tip for organizing and keeping soup labels and Box Tops for Education. My kids' school collects these too, and when we use an item with these types of codes I like to save them for donation. (Every extra little bit of money helps!) Having a space right near where you throw the rest of the container is a simple but very effective way to save these in a place convenient for you, and that will help you remember to save the codes. I am totally going to do this in my home now! 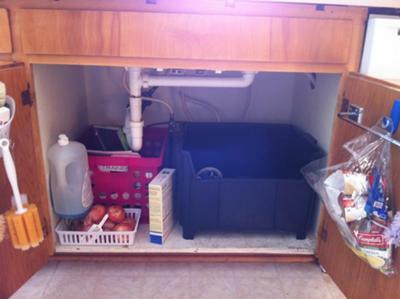 Here's another photo from a reader, Paula, below, who also keeps her recycling bin, and trash can, under her sink. Paula said, "Undersink cupboard. Garbage on left. Returnables on right (5c ME deposit) soda, beer, wine, plastic water and juice bottles and jugs." 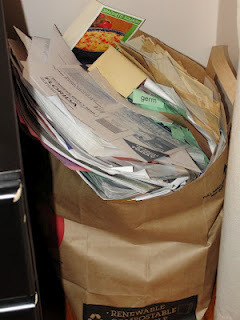 Above is a photo from a reader, Joan, who showed off how she sorts and stores her recycling before it's dropped off. Joan said, "This challenge was accomplished years ago. Works great! Sits in my kitchen where it is most convenient. Painted and polyurethaned to match other pieces in my kitchen." Jan from The Crafty Mermaid's Grotto shared her family's recycling system on her blog, in response to this week's challenge. She too has a good system in place, which works well with the recycling rules where she lives, and for how often they pick up recycling, and what she needs to take herself. I really like how she's used some labeled garbage cans for home recycling bins and containers in her garage. It think it is very important to label all your containers and bins with what type of items should be in there, especially if your recycling center requires you to presort so you make it as easy on yourself (and your redemption center) as possible. Here are some examples of garbage cans, in various sizes and shapes, which are labeled as for recyclables. Of course, you could easily use a regular garbage can too, as long as you labeled it for recycling. Another thing I really liked about Jan's system for recycling is that she also had some small containers for holding the odd recyclable items you gather around your house, like certain types of light bulbs, electronics, etc., but that don't fit into the common recycling system such as paper, plastic, metal or glass. Just having a small basket or container for such items, which you deal with periodically, is a really good idea. Here's another photo below, sent in by another reader, Sarah. 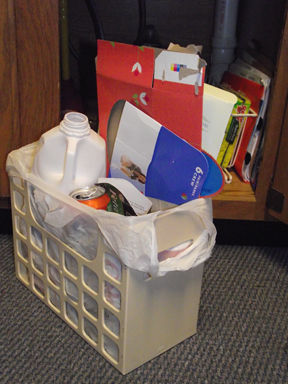 Sarah said, "We are new to recycling and our town requires us to sort and drop it off ourselves. So, I got these cheap trash cans from Walmart. I had to make signs to stick on the front because we are learning what goes where and what can't be recycled. The grey one is one we already had and is just for regular non-recyclable outside trash. Fun project. I've been working on it for about a week." 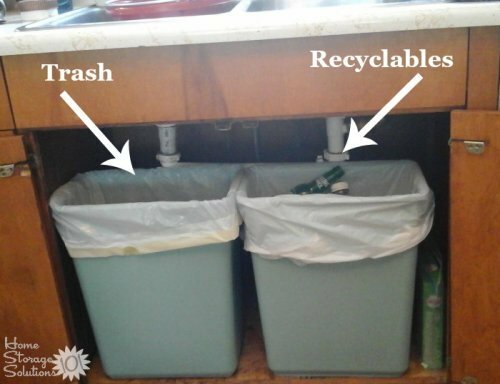 Dawn shared her system for recycling in her home. I already had a system in place and it works well for us so I didn't make any changes. 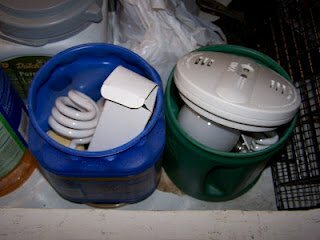 One easy, cheap trick I have for collecting recycling is using an ice cream bucket under sinks in bathrooms or where ever you might need a small one. 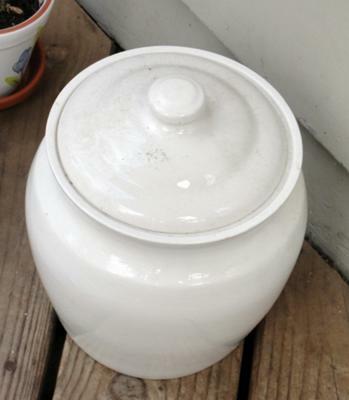 I also keep a ceramic jar outside by kitchen door for compost scraps. I found it at Goodwill for cheap. After completing all six challenges so far, I'm feeling much lighter from clutter and junk overload! 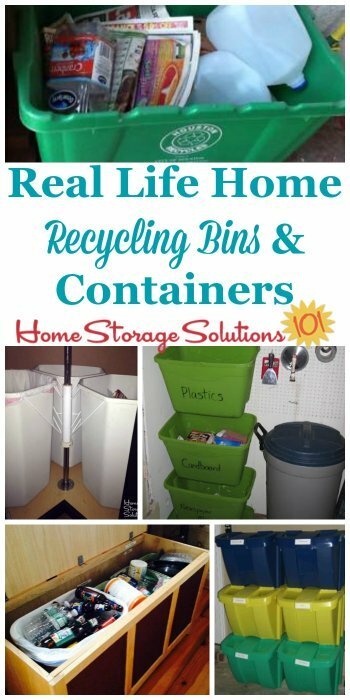 Thanks so much for sharing these ideas for how to recycle. I especially like how you've recycled items to use as your home recycling bins, which is the real essence of recycling. We set up this recycling system when we moved into this condo three years ago and it is working well for us. 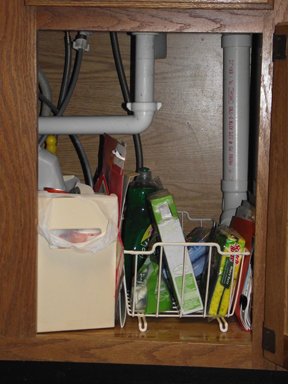 Picture 1: We put plastic, glass, cans & lightweight cardboard in this bin under the kitchen sink. Picture 2: When this container is full I take it to the garage to empty. Picture 3: We put paper in these bins at the end of the kitchen cabinets. Picture 4: We sort the plastic, glass & metal into the green bin which goes out weekly for the city to pick up. The lightweight cardboard goes in the blue bins and heavy cardboard lies on top. About once a month I take the cardboard & paper (from the kitchen) to the county recycling center. Thanks for sharing these pictures Anne, and the explanation of each. I can tell you've really thought about where you need to collect recycling, and have placed your containers and bins strategically to collect the items where they are generated. 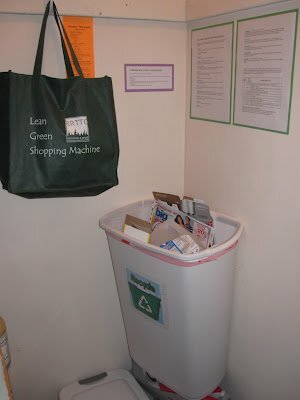 I hope these pictures have given you some ideas for how you can arrange the recycling centers in your own homes. If you've gotten inspired, I would love for you to join the 52 Week Organized Home Challenge here on the site. During the course of a year we organize each room and type of item in our homes, so that by the end we've organized the whole thing! As you can see from these pictures, it's really making an impact in people's homes, and it can in yours too. 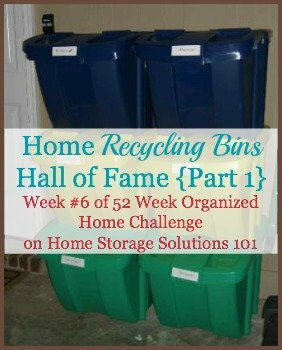 Further, if you do the Home Recycling Center Challenge I'd love to see your results. Be sure to take some pictures of the system you create for your home, and send them into the Home Organization Hall of Fame here. Then, I'll feature the best ones here on the site! We're lucky enough to have single-stream recycling: everything goes in the same bin so we just take it straight out to the curbside bin. I love this idea. I had an empty bin and am going from room to room and as I finish a room I go and recycle it. What a great idea. My rooms are getting bigger and bigger. Our town recently provided us with the wheeled covered recycling cans. I keep it right outside my side door and pretty much put the recyclable items in several times a day and wheel the can out on garbage day. I love that all the items, especially the papers, stay dry and the items do not blow around. My issue is running out of bin space. I have to end up using 2 bins from the town and my own. One thing that is a must! Clean out your bottles, soda cans I wash out with warm water so we don't get bugs. I have bins in the garage for cardboard, plastic, cans & glass. I keep a trash can by the back door and put all my recyclables in there after they've been washed or broken down. When it gets full I take the trash can out to the garage and sort it into the appropriate bin. Our city doesn't provide pickup. There are community recycling centers and we have to take it and drop it off in their bins. Fortunately, we have this service from our trash company. I have a separate bin in my kitchen for paper that's emptied when full. Bottles are collected and taken to the bottle bank. no sorting now, so it's easy and we actually do it! Our county just started a new recycling program. They provided a 90 gallon blue recycle bin that all recyclable items (types 1 through 7) go into and they pick it up once a week. We did not recycle before. We do now because it is so easy. My city has two collection sites where we can take recyclables and sort them. I keep a trash can in the laundry room and we put items in it. One of the kids then has the job of sorting into bins in the garage when full. 2-3 times/month my oldest child takes everything to the collection site near his job. My family of six had only two bags of garbage last week. We recycle cardboard, glass, plastic and pop cans. The important thing is to RINSE out the food containers. Then you won't attract mice. Our city has a recycling program twice a month. We keep our bins (from IKEA) right outside the entrance door of the garage and take things out every night. Those bins get emptied on Wednesday nights into the large city bin when we're ready to set out the garbage bin. Works for us! We recycle and compost, practically no garbage. Not an ideal solution for everyone, I know. Love the freezer compost idea! I've wanted to start composting but kept getting discouraged by fruit flies and the fear of smell and our cat tampering with the container. Putting it in the freezer would make me feel much better about keeping it unavailable to our cat/dogs and insects as well as keeping any odors down. Thank you so much for the tip!! City gave us a recycle box years ago, about size of laundry basket. Years later we got a rolling cart, same size as our garbage can. I keep box by back door and toss stuff in it throughout day. When full, dump it in big bin. We recycle glass separate from the other recycling so that has its own container. We save newspapers for our vet with the slick newspaper pages going into the recycle bin. We only recycle the newspapers and plastic weekly. The others as needed. We have a cart in the foyer to collect all recycling and as we go towards the breezeway we take the recyclables to their respective containers. This has been working well for at least a couple of years. About 3 years ago we decided to start recycling in our home. Our city has developed a state-of-the-art recycling center that takes literally everything (from styrofoam to office waste). My first step was to get a large recycle bin and place it in our laundry room, next to the washer. This room is central to everything in our house. I use this bin as a gathering bin, just throw anything except food products and tissue products in. 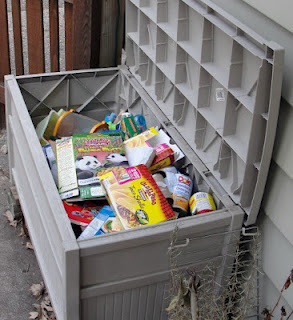 On the weekends, I take the gathering bin out to our garage, where I have 6 other bins. I separate all the items and take them all to the center. Additionally, I gather all the office waste / plastics, etc. from my office and add that to the mix. For all organic food product waste (except meat products), I keep a mid-sized plastic container in the freezer and put all compostable waste in it. I put about 1" of water in the bottom, and simply add the product as I generate it. When the bin gets full, I set it in the sink to defrost, then tamp the product down, shake it to mix the water, and place it back in the freezer. About 1x a month, I add it to the compost pile. Using the freezer keeps the waste out of my way (and bug free), and helps with the composting process. For what is not recyclable or compostable, I have a trash compactor in the kitchen. We only empty it maybe 1x a month.